Author: Uta Reuster-Jahn. Series edited by: Wilhelm J.G. Möhlig. 10 pp. Roman, 573 pp. The present study is a documentation and survey of oral literature of the Mwera of south east Tansania. Part of this literature consists of ndango, fictional and traditional stories which are determined by their content as well as the way and the circumstances of their performance. Mwera is a Bantu language counted among the Yao cluster (P.20), together with Makonde, Yao, Ngindo und Ndonde, spoken by about 469.000 people (estimation of 2001). In the past, the language and culture of the Mwera have been studied only slightly. The basis of this analysis is formed by the organic units of three narrative sessions that were recorded in two villages, comprising 29 stories. These stories are discussed concerning both their content and their performance. In particular, the interaction between the participants during the narrative performance (chapter 7) is of special interest in this analysis, a point touched upon only intermittently in past studies of oral literature. The author defines the role of a respondent who functions as a representative listener who provides reactions and counterpoints the narration, but at times also functions as a co-narrator. An innovative feature of this study is the employment of conversation analysis to describe the activities of narrator and respondent. 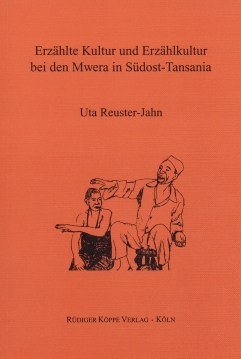 The appendix contains an extensive textual documentation, consisting of transcripts of the Mwera performances and their German translations by the author. Furthermore, a typology of audience interaction during narrative processes in Africa is attempted, using the representations of audience responses contained in published documentations of oral literature. A reader on African literatures as well as a dictionary of Mwera–Swahili has also been published in our programme, see under additional material. Following the link below you will find a paper collection in memoriam of Thomas Geider (* 25 April 1953, † 15 October 2010) who supervised the author when finishing her research. More in general we are provided with an excellent account of how stories are performed in such way that they come to life as convincing dramas by means of demonstratives, gestures and ideophones, of which Mwera possesses a great number, as well as direct speech in dialogues and inner monologues. Their scenic presentation makes the telling of these stories into a real countryside cinema, as well educated informant put it to the author (p. 177). The careful transcription allow the reader to enjoy them thoroughly. Die 1999 als Dissertation in Mainz vorgelegte Arbeit hat mit Recht den Lutz-Röhrich-Preis 2001 der Märchenstiftung Walter Kahn für die beste studienabschließende Arbeit erhalten. Mit einer beachtenswerten Gründlichkeit behandelt die Autorin die Überlieferungen der Mwera, einer bis dahin wenig bekannten bantu-sprachigen Volksgruppe.